TPH writer Carson Kohler at Great Clips in St. Petersburg, Fla. When I walked into work last week, my coworkers oohed and aahed at my new shoulder-length bob haircut. I smiled, grateful for the compliments, but also because I was keeping a sneaky little secret: My fabulous new haircut cost me just $9. You don’t have to spend a fortune to look flawless. As a dedicated penny hoarder, I’ve been looking for money hacks in all areas of my life, including the essentials. Let’s face it, both women and men can only go so long without a haircut, especially if you’re a guy who’s not trying to hop aboard the man-bun train. Depending on where you live, a typical women’s haircut can range from $40 to $110, with men’s cuts coming in slightly lower between $25 and $50 (and don’t forget the tip!). That’s a lot of money if your paycheck is already stretched between rent, groceries, gas and other necessities. And while a haircut may seem frivolous, never underestimate the power of looking — and feeling — your best, especially if you’re on the job market, attending networking events or trying to score that big promotion at work. No one has to know how much you saved on that fabulous new bob or that trendy undercut. Here are four ways to get stellar, stylish, cheap haircuts — no more dropping serious cash at the salon. It may sound sketchy to get your hair trimmed by a student. But as long as you’re willing to be patient, you can walk out with a professional-grade haircut and extra money in your pocket. Search online for a beauty institute or hair school near you. Most offer haircuts for a fraction of the price you’d pay at a traditional salon. If you’re worried about quality, never hesitate to read reviews from past customers. Paul Mitchell’s school in Denver charges just $13 for a haircut and style. At the Aveda Institute in Los Angeles, you’ll pay just $19 to have your hair cut and styled. A haircut at the Empire Beauty School in Boston, which includes shampoo, conditioner and a blow out, is just $9. Here’s how the process works. You call the beauty school and request an appointment, just as you would at a traditional salon. 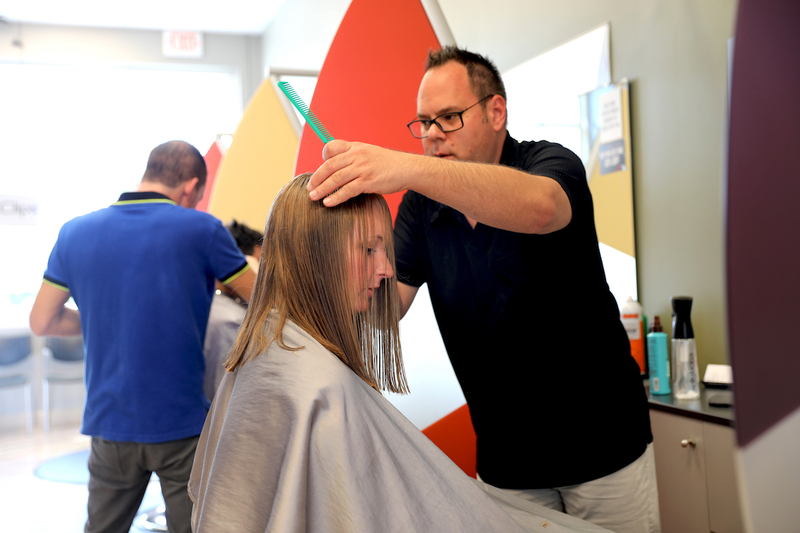 Some institutes will allow you to select a stylist based on his or her experience level — typically from tiers such as beginner, intermediate or advanced. Next, your hairdresser will flag down a supervisor to talk specifics — they’ll go over which instruments the stylist plans to use or what color combinations would look best. Because they want to earn high marks in class, most students are meticulous, checking and double-checking every move they make. This may result in your haircut taking a little longer than it would at a traditional salon, but your patience is worth it. The supervisor will stop by your chair at various points throughout the process. At the end, they’ll inspect your hair, re-measuring the length and checking the stylist’s work. They may trim up a few loose ends or share pointers with the stylist for nailing a certain technique they’ve discussed in class. When you’re all done, you’ll have a salon-quality haircut for just a couple bucks. If you were impressed with your student, don’t forget to tip. And remember to look at what other affordable services the beauty institute offers. If you can’t bear to give up your monthly manicure, consider getting your nails done at a cosmetology school to save a little cash. Mmmm, happy hour — drink specials and yummy appetizers that don’t break the bank. Some salons adopt the happy hour philosophy by offering special deals when you visit on certain days of the week or during their slow periods. If you’re not into the idea of getting your hair styled by a professional-in-training, consider visiting a traditional salon when you can get the most bang for your buck. The salon only takes cash during happy hour, but the savings are worth it. A women’s haircut, which includes shampoo, conditioner and a blowout, typically costs $55. At happy hour, it’s just $35. At the Chop Shop Hair Studio in Knoxville, Tennessee, you can get 10% off your haircut during happy hour. And in true happy hour spirit, the salon will also throw in a glass of wine for free. A little digging online can help you find other salon-specific ways to get cheap haircuts. Some salons offer first-time customer deals or discounts if you show your student or military ID. Many new hair studios that are trying to drum up business offer deep discounts with the help of sites such as Groupon and LivingSocial. When a professional stylist interviews for a job at a salon, they’re often required to prove their skills with a live hair-cutting demonstration. If you’re willing to lend them your hair, you can get a free or discounted trim. The website Salon Apprentice posts dozens of requests for volunteer hair models in cities around the country. Sometimes a stylist needs a volunteer model for other reasons, such as to practice a trendy new haircut, so the posts often call for models who are willing to have their hair cut in a specific style. A stylist at Bumble and Bumble salon in New York City recently needed volunteer models who were interested in a graduated bob haircut. As a typical Bumble and Bumble salon guest, you’d pay between $99 and $250 for a haircut — so as a volunteer model, you could see huge savings. As Penny Hoarder writer Carson Kohler recently discovered, you can save a lot of money by ditching your exclusive salon and visiting affordable haircut chains such as Great Clips instead. She typically spent $54 four times a year on haircuts. At Great Clips, she realized she could pay just $15 per haircut (tip included), a savings of $40 per cut. Over the course of an entire year, that’s $160 in savings. The best part? Her stylist had 30 years of salon experience and her haircut was fabulous. Many storefront chains offer services à la carte, meaning that if you don’t want to get your hair washed, you don’t have to; this choice saved Kohler $4. She also earned a $2 discount by checking in for her appointment online. Bottom line: Don’t feel trapped by sky-high salon prices — there are so many ways to find cheap haircuts. You don’t have to let your locks suffer just because you’re trying to save money. You can look fabulous and be a Penny Hoarder at the same time! Your Turn: What’s your favorite way to save money while looking flawless?